How religious was Alexander the Great? PAUL CARTLEDGE Jamie, it's very hard indeed to penetrate the psychology of any prominent ancient (Greek or Roman) figure, I find, apart perhaps from Cicero and Augustine, because we usually lack the right sort of intimate auto/biographical sources – but in the case of Alexander I wonder whether you agree that one way in from the outside as it were is by considering his religious attitudes and practice. I'm not thinking here of the vexed question of whether he thought of himself as in some sense divine – or at any rate possibly ordered others to behave towards him as if he were! I mean, rather, do you agree that he seems to have been quite exceptionally pious, even superstitious – especially in the offering of animal sacrifice to various gods and heroes, and in his constant recourse to divination? The index entries in The Landmark Arrian under 'Aristandros of Telmessos' (Alexander's favourite soothsayer) and 'sacrifices offered by Alexander' are I think a good point of departure. JAMES ROMM Yes I would agree (and thank you for noting the utility of that index!). I must say I have not made a study of the sacrifices and prayers you mention, but I know that Alexander gave thought and consideration to each one — choosing the particular god or gods to address based on the territory he was on, the culture that surrounded him, or the tactical demands of the situation at hand. If we trust Arrian's evidence, he believed in the efficacy of sacrifice and the predictive power of omens (though he ignored an omen that told him not to cross the Jaxartes when he badly wanted to — an interesting case of pothos trumping piety). What's also interesting is the range of beings he sacrificed to — not just the Greek gods and heroes, but to Bel-Marduk (in Babylon), the Apis bull (in Egypt) and Ammon (in India), among others. Of course, some of this heterodoxy was good politics — showing new subjects that he embraced their religious traditions — but my sense is that Alexander felt a personal attachment to these foreign divinities. After all, he wanted to be buried next to the shrine of Ammon in the desert west of Egypt, or so Quintus Curtius tells us. to make himself into a new kind of Graeco-Oriental monarch? And what do you think the average Greek subject of Alexander's empire might have thought of their ruler's religiosity? JR Paul, those are such big questions that I suggest we take them up in the next segment of our discussion. We have also deferred the question you alluded to at the outset, whether Alexander thought he himself was divine. That's a big one indeed, and a tough one! 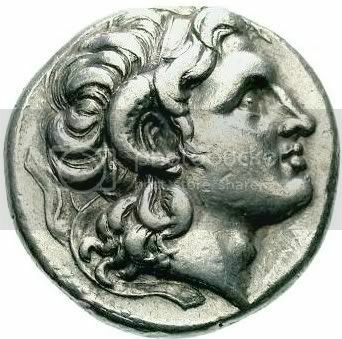 But to conclude the current discussion: I want to note in connection with your last remark that Alexander was commonly depicted by his Successors with ram's horns curling from the sides of his head, an image that may have perplexed some of our readers. The ram was associated with Ammon in the ancient world, since that god had once taken the form of a ram, so the horns are intended to show kinship with Ammon — not Zeus, as one might have expected (though Alexander seems to have depicted himself wielding Zeus' thunderbolt on the so-called elephant medallion). The coins with the ram's-horn image circulated all across what is now the Middle East, so when we later find Alexander referred to in the Koran as "Dhul Quarnain" — The two-horned one — it's likely that those Hellenistic coins are the reason!